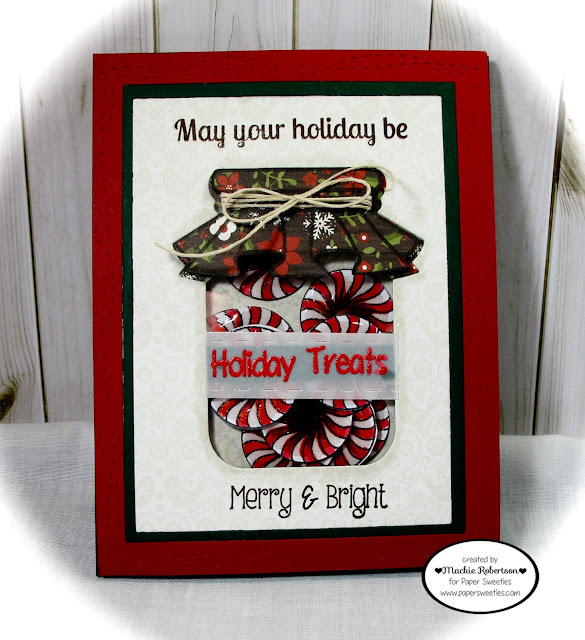 I created a shaker card full of peppermint candies! I stamped lots of peppermints from the Baked With Love stamp set. I colored the candies with Copic Markers and then covered them with Glossy Accents. I set them aside to dry overnight! I used the Paper Sweeties HomeMade With Love stamp and matching Sweet Cut to make the cute jar! I stamped the lid onto some pattern paper and fussy cut it out. Next I took the HomeMade With Love Sweet Cut and placed into the middle of another piece of pattern paper, and cut out the shape of the jar. I glued a piece of acetate to the back of the cut out panel to form the shaker. Next, I added foam tape all around the back of this panel to create a space for the peppermint candies! Before glueing the topper to the jar, I added twine and made a bow. I stamped Holiday Treats onto some vellum and heat embossed the letters with red embossing powder. Then I took one of the sentiments from the new Merry Little Christmas stamp set and cut it into 2 pieces! I stamped one part at the top of the page and the other part at the bottom of the page! I hope you have enjoyed seeing mine and my teammies creations this week! And hopefully you have been inspired to create!!! Awesome jar filled with peppermints, Mackie!! Great way to incorporate all the sentiments!! The embossed sentiment on the vellum is very eye catching...fab card!! Love your peppermint shaker Mackie! So fun!!! What a fabulous card, Mackie! Those candies look perfect in the jar! LOVE this!!! Especially the shiny candies -- such a great overall idea! This is such a cute card Mackie!! I like the pretty little jar topper and the fun peppermints! Super cute Mackie! Love the jar full of treats!